Yesterday I texted Nick to ask if he wanted to make jambalaya for dinner. Because it was Fat Tuesday. And because he loves spicy Cajun food. It took him less than a minute to respond, “Yes!” He even did the grocery shopping before I got home from work. 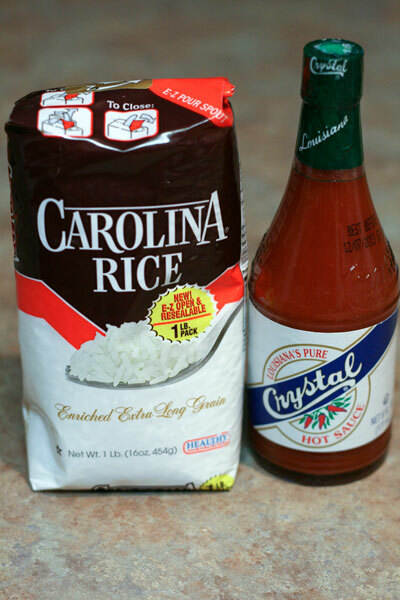 In addition to the necessary ingredients — onions, peppers, tomatoes, and kielbasa — he picked up some Carolina long-grain rice and Louisiana hot sauce. Nick browned the kielbasa and smoked ham while I chopped the veggies. Then he removed the meat from the pot, and I cooked up the “holy trinity” of Cajun cuisine: onions, bell peppers, and celery. 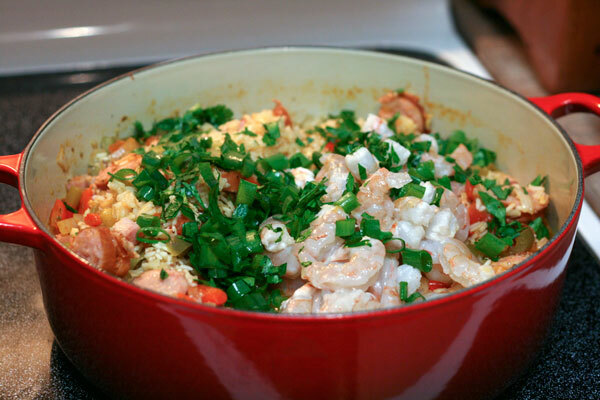 After the jambalaya simmers for 30 minutes, add the parsley, scallions, lemon juice, and shrimp. Stir together, return the lid to the pot, and remove from heat. The hot jambalaya will steam the shrimp just perfectly in about 15 minutes. This dish is thick and hearty and flavorful with just the right amount of kick (though you can add more hot sauce if you prefer it as spicy as Nick). Garnish with more parsley and scallions, and devour! This dish is just too good to only eat once a year. So why not celebrate Mardi Gras again this weekend? We might. How did you spend your Fat Tuesday? Heat oil in a large Dutch oven or stock pot over medium heat. Add kielbasa and saute for 8 to 10 minutes, until browned. Remove kielbasa to a bowl, and set aside. Add ham to the same pot and cook 8 to 10 minutes, until lightly browned. Remove to the bowl with the kielbasa, and set aside. 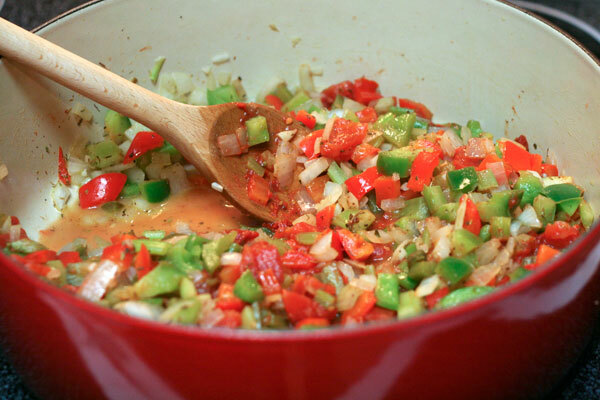 Add butter, onion, celery, and peppers to the same pot and saute for 8 to 10 minutes, until onion is translucent. Add tomato, garlic, jalapeno or cayenne, oregano, thyme, and tomato paste, and cook until all of the vegetables and herbs are blended well. Add stock and bring to a rolling boil. Stir in the rice, and add the kielbasa, ham, bay leaves, salt, pepper, and hot sauce. Return to a boil, reduce heat to low and simmer, covered, for 20 minutes. Add 1/4 cup of scallions, 1/4 cup of parsley, lemon juice, and shrimp. Stir well. 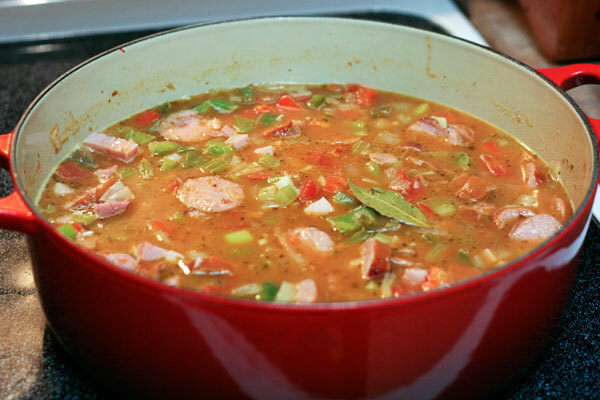 Cover the pot, remove from heat, and allow jambalaya to steam for about 15 minutes before serving. Garnish with remaining 1/4 cup scallions and 1/2 cup parsley, and a dash of hot sauce, if desired. yum! 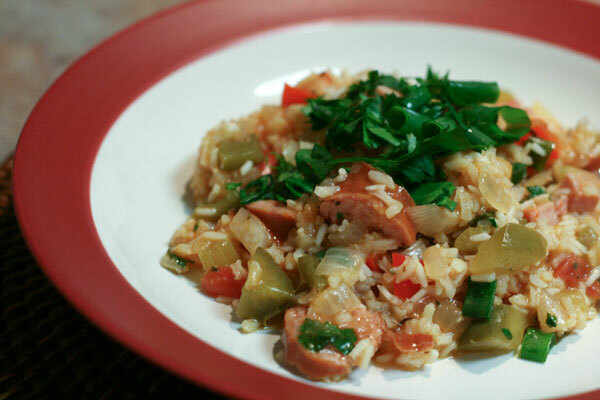 I remember watching the Barefoot Contessa make this (or a similar) jambalaya. This post is making me in the mood for my May trip to Nawlins! 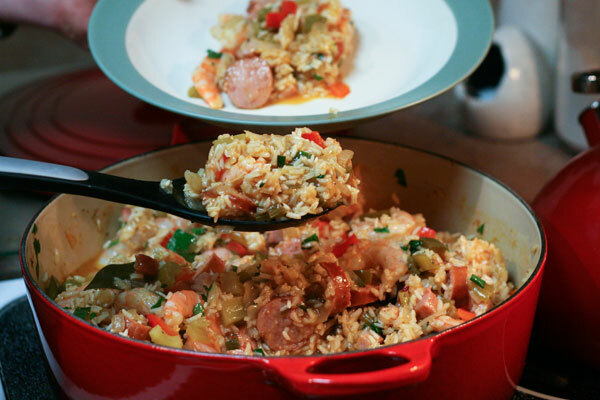 I’ve been meaning to try to make jumbalaya–i think this is just the encouragement I needed! It looks delicious! Here you go! 🙂 It was incredible! This looks just so delicious! WOW! New to your blog; happy I found you! Congrats on your newest addition! Hi there! I found this recipe via Pinterest and added it to our weekly meal plan for this week. Im super excited to try it, but I have a question? In one of the steps it says to add tomato, garlic, pepper of choice, and herbs, however, the recipe ingredients dont list either fresh or canned tomatoes other than the tomato paste. Should there be tomatoes or was that an accidental typo? I want to make sure i get the recipe exactly right. It looks so wonderful and I cant wait to try it. Thank you! your phone allowing you access to it later on. the fat juices do not get absorbed by the chicken.